Rockford Rhythm Begins Tonight! A new local drumline program. 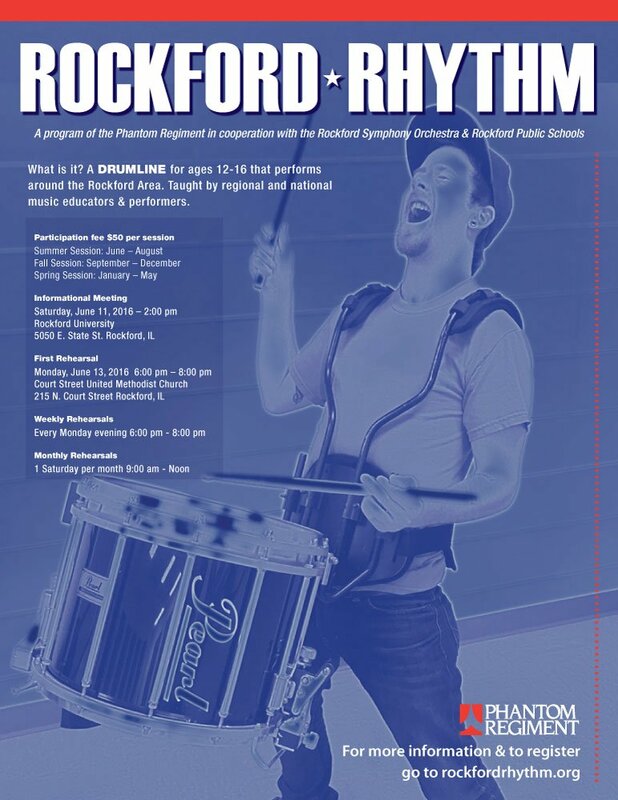 Area Organizations Partner to Launch Student Drumline Program, Rockford Rhythm! The program will offer percussion instruction taught by regional and national music educators and performers and offers opportunities for performances year round. The drumline will rehearse on Monday nights at Court Street UMC and one Saturday per month. Rockford Rhythm will perform at area events throughout the year. The Phantom Regiment is a Rockford-based youth organization dedicated to the development of self-esteem and self-reliance since 1956. It encourages team work, sportsmanship, civic pride and contributions of one’s personal best to a group effort. These lessons are learned through a musical and marching activity in which there is a blending of the arts and athletics. The Rockford Symphony Orchestra is a regional, award winning professional orchestra performing in the Coronado Theater from October through April. The RSO is under the direction of Music Director Steven Larsen, who is celebrating his 25th season as conductor.